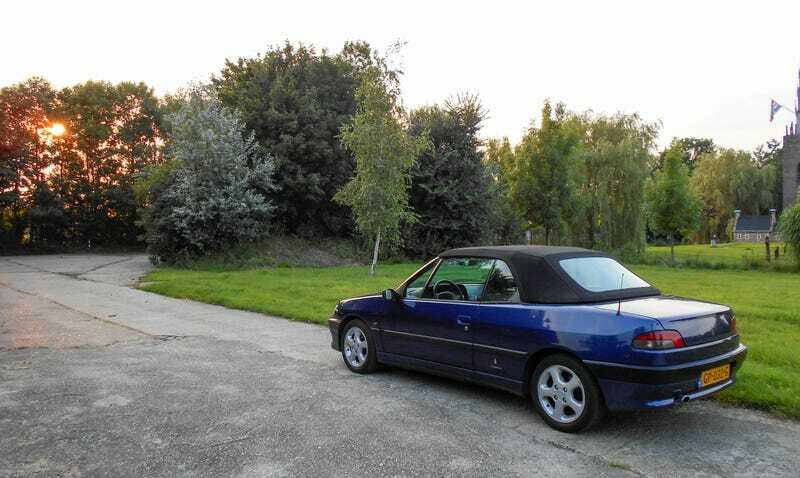 Shot some pictures of the convertible Peugeot I bought yesterday. In the process it made two friends, one of the furry kind and the other of the French goddess persuasion. The 306 does have a few problems, I found out. Tachometer, power mirrors, heated seats all don’t work. A check engine light came on after I bought it. Power convertible top works, but doesn’t fold itself properly. Still not bad for what I paid*, assuming the fixes won’t be too costly. No pictures with the top down because, well, see the previous paragraph. The spots on the paint are bugs, not damage. The exterior is absolutely immaculate, save for a spot on the rear bumper. The goddess was parked a few hundred meters from the odd little church. *) Let this be a guessing game.